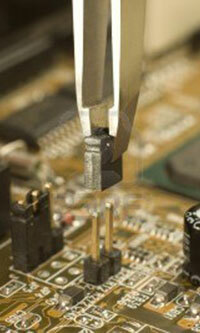 Your world class manufacturing solutions for electronic assembly and production requirements. In service to all segments of the industry including Military, Aerospace, Medical, and Consumer Products. Our experience makes a difference! APS Industries, in partnership with Advanced Precision Distribution, offers in depth solutions to today’s complex manufacturing challenges. As a representative of some of the most highly respected and innovative companies in the industry, APS will provide you with best in class equipment along with technical knowledge that will put you on the fast track to success. Companies like Samsung Techwin, who offer complete line solutions for your SMT board assemblies, are our partners. APS has experience from the very beginning of your production process to the final testing and packaging of your product. Advanced Precision Distribution is your source for everyday consumable products used in the assembly of printed circuit boards and other common electronic assemblies. As one of the largest stocking distributor in the US for AIM SOLDERING PRODUCTS we provide all the materials such as solder paste, wire, flux and solder bar used in your everyday production. Our full product offering, from work benches to microscopes, is your one stop supply chain. As a graduate of U Mass Dartmouth with a BSEE degree Ken Masci prepared to enter the challenge of the ever changing electronic industry. He founded his first manufactures rep company in 1984. Keeping up with technology has been exciting and rewarding. The experience that time brings along with technical knowledge is a critical asset to his customers. In todays fast pace market and short product life, large investments in capital equipment can be the source of success or failure. Ken understands ROI standards that will contribute to your company’s success.